"This exhibition sheds new light on Isaac Newton, the greatest physicist of all times. The manuscripts of this collection, one of the treasures of the Jewish National and University Library, discuss Biblical interpretation, the architecture of the Jewish Temple, ancient history, alchemy and the Apocalypse." "Contrary to his public image, most of Newton's work was not devoted to science but rather to theology, mysticism and alchemy. 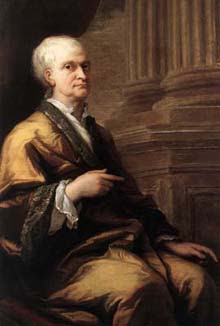 Unlike Newton's scientific texts, which are owned by the University of Cambridge in England, the 18th century thinker's theological writings made their way to the National Library of Israel in Jerusalem, and they have just recently been digitally copied and posted on the Internet in cooperation with Cambridge University's Newton Project. Apparently only two people showed up for the auction of Newton's writings, the noted British economist John Maynard Keynes and the Jewish Orientalist and book collector Abraham Shalom Yahuda, so the two divided the spoils. Keynes bought Newton's alchemy manuscripts while Yahuda got Newton's theological writings. After Yahuda's death in 1951, his collection of Newton's work was transferred to the National Library of Israel. "